Golf Stance - Does it Matter? The golf stance is a crucial piece to your golf setup but there are many ways to setup to a golf ball. In most golf instruction magazines you will see a stance/setup that is basically a one size fit all style, however, this is impossible due to the unique physical traits that golfers have. A golf stance that aligns your body perfectly parallel to the target may be ideal in a perfect world for beginners but if any observer were to take a look at any average golfer or Tour player he/she would see that everyone employs different golf stances for their swings. The reason would be because of numerous variables such as physical build, ball position, release sequence, swing path, impact point, etc. In case you are a beginner at this game and looking for a place to start then you may want to start out aligning your body parallel to your target so you can develop a feel for the swing plane and impact. Once you start making consistent contact you will then be able to modify your golf stance based on your results. 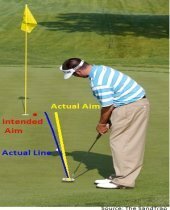 As for avid golfers, in order for you to figure out the best golf alignment for your swing you will need to observe your swing path and face angle at impact. An easy way to determine these two factors would be to pay attention to your ball flight and knowing the rules that produces it. For example, a draw occurs when contact is made on the back side of the arc with the direction of the clubhead moving right of the target line(Club Path). The clubface has to be open to the target line but closed to the club path at impact. To understand what this means look Fred Couples below. 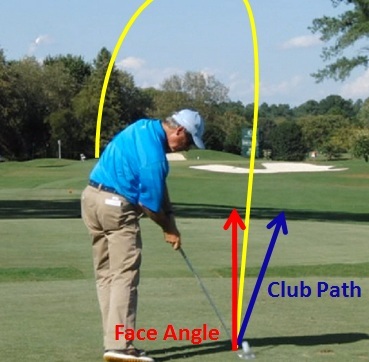 The red arrow is the direction the face of the club is pointing at impact. The blue arrow is the direction the club is moving through impact. The ball will start 85% to the face and then will curve due to the separation of the face and path. As for hitting a fade, contact is made on the front side of the arc with the direction of the clubhead moving left of the target line(Club Path). The clubface will need to be pointed left of the target line but slightly open to the club path at impact. The red arrow is the direction the face is pointing at impact and the blue arrow is the direction the club was moving through impact. 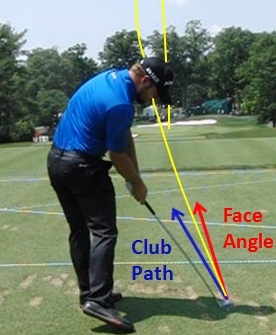 Due to this separation of the face and path of clubhead, the result is a fade. If you would like to learn more on these rules and how they can be applied to your game, please visit the D-Plane. The best way you can find out your club path and face angles at impact would be to get on a TrackMan, FlightScope, or ForeSight device. All 3 devices use either radar or high speed cameras to measure multiple variables in your swing. To find a one of these devices you will need to do a little research in your area on which teaching professionals that carry it or you can visit a fitting day at a facility nearest you. Most club fitting days will have a measuring device on site to enhance the fitting process for the manufacturer's clubs. This would be an excellent way to test your swing variables that is usually free or at a minimum price for the session. To find a club fitting day near you, search all the major club manufacturer websites and you should find a page with events near you that displays all the locations they plan on doing a fitting day at. Once you know your numbers you can then start to make the adjustments that are needed to enhance your golf stance. For an example, if you are comfortable playing a left to right fade and would like to make it consistent then the easiest way to ensure a fade every time would be to align your feet, knees, hips slightly left of the target line while keeping your shoulders square. If this doesn't do the trick then turn your left foot out about 25 degrees and this should help. By setting up in this stance you are increasing the chances of coming through impact zone with the club path left of the target line which is a must in order to ensure a fade back to the target. You would then need to have the clubface open to the club path at impact so it produces a fade. To learn more about playing the fade then please visit Golf Fade. If you find yourself comfortable playing a right to left draw and would like to make this your pattern then you can move the ball position back, lean the shaft of the club forward, and turn right foot out 30 degrees. Setting up this way will increase your chances of approaching the ball from the inside which will have your club path direction moving to the right of the target line. This is a key essential in producing a draw as it will help ensure the club path is moving to the right of the target line with the face closed to that path so it will produce a draw back to your target. To learn more about the draw then please visit Golf Draw. You should now understand how important the golf stance is for your game. By matching your stance to your swing pattern, you should start becoming more consistent. However, there are many variables to setting up for success that it may require you to contact a local teaching professional to help you figure out the setup that best suits your game. 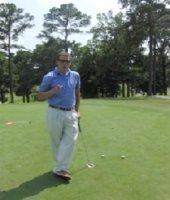 If you have any questions in regards to the correct golf stance to employ for your game, then feel free to ask me over in the Golf Questions Section.